The image shows a scene in one of the J. Lyons & Co. tea-shops, which were inexpensive and enormously popular in the first half of the twentieth century; the waitresses, in their distinctive uniforms, were known as 'Nippies'. 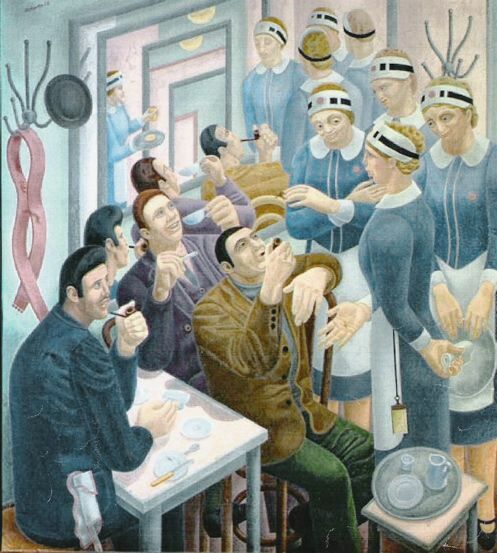 The chain was in decline when Roberts reproduced one of the studies for this picture in his Paintings 191758 in 1960, which may explain why there and when exhibited by Anthony d'Offay in 1969 the studies were nostalgically entitled The Good Old Days. Even in the late 1960s William Roberts still frequented J. Lyons' establishments: a pencil sketch, The Joke 1969, was drawn on the back of a bill from Lyons' The Restful Tray, Marble Arch  'one of William Roberts's customary outings of an evening' according to John Roberts's catalogue notes for Gillian Jason Gallery (2) 1986.